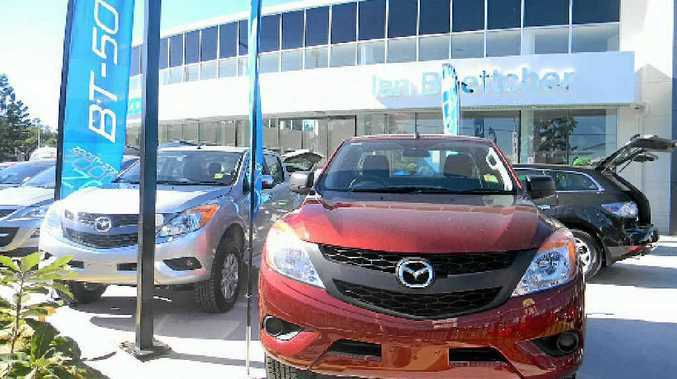 BEEFY: Strength, safety and heaps of space are key elements in Mazda’s BT 50, now available at Ian Boettcher Motors. Is it your time to Zoom-Zoom? IT'S been built to do everything you need, and even more, well that's the quote Mazda claim with the 2011 Drive car of the year, the BT 50. And can I say, after Big Rigs took the challenge, I would have to agree. When Ian Boettcher Mazda of Booval, offered us a BT 50 to test drive for the weekend, I jumped at the chance, not just because I am looking for a 4WD of my own, but the look and features made me curious. The first thing I noticed when I loaded the missus and kids into the ute, was the space and attention to detail that has been put into this vehicle. My son, being quite a tall lad, easily fit into the back seat, even behind his old man who likes to sit near the back seat while driving. This space has been spread through all the facets, from front to back. The BT 50 dual cab fits five adults comfortably, with respect to both leg and head room. There is also an abundance of room in the cargo box or as most of us call it, the tray. There's also plenty of room for your sunglasses, drinks, a set of tools and more. Strength was also key during construction - the BT 50 is one of the most rigid of all utes. With its reinforced ladder frame chassis, it is capable of taking on the toughest of jobs. Wishbone front and rear suspension deliver car-like handling with hardworking durability. I can testify to the handling. I put the BT 50 through its paces on the highway, around town, on dirt tracks and so on. By the end of the workout, I must admit, I was more than impressed with the feel and power of the vehicle and so was the wife. Safety has not been forgotten here. The BT 50, was constructed with high-tensile steel and extensive reinforcing, to help achieve an occupant cell of exceptional strength. Its responsive handling and steering means you are well placed to avoid potential trouble if it occurs. Front and head protecting curtain airbags have also been included while freestyle and Dual Cab models also have side airbags in the front. The powerful braking system is also backed up by ABS and Electronic Brake force Distribution which optimises braking force. It also comes with traction control. The BT 50, comes in single cab, dual cab, 4x2, 4x4 and a range of colours. So why not get in touch with Roy and the team at Boettcher Mazda (Ipswich Rd, Bundamba. Ph: 07 3817 3600) or visit www.iboettcher.com.au to test drive one of the vehicles in the BT 50 range today. You could be Zoom-Zooming with Mazda before you know it.